The intent of this material is to communicate the best practices for design of Segmental Retaining Walls (SRW) as determined by Allan Block Corporation based on 25 plus years of research, design and field experience. This is not meant to be a final authority as each project has its own set of unique situations. The local engineer of record must use their best engineering judgment to account for those situations that present themselves and provide a safe and efficient design for the customer. At no time does the contractor or local building official have the authority to override the approved plans and specifications provided from the local engineer of record. It is the recommendation of Allan Block Corporation that the local engineer of record work for and be paid by the project owner. It has been determined that the local engineer of record should be the Project Site Civil Engineer as they are best suited to take responsibility for the design, and how it affects the site, whether they do the design in-house or use an outside consultant to do the design for the project. The Project Site Civil Engineer has control of several of the overall aspects of the project and therefore is most able to properly handle the integration and communication required to ensure the performance of the wall complies with the needs of the site. For wall design applications that are outside of the experience level of the Project Site Civil Engineer, a wall designer with the appropriate knowledge and experience should be contracted with by the Project Site Civil Engineer. It is recommended that the wall contractor not be responsible for securing the engineering. Click on the topics below to view more information on the best practices for Allan Block segmental retaining wall design for residental and commercial applications. Design Guidelines Item: The term, "owner" refers to the property owner or their designated representative. 1.1 Meeting with owner to fully understand the basic needs for the site. What is the general use of the site? Know what the site will be used for commercial, residential, public, etc. Knowing the site use will often dictate design loading, design methodology and level of effort required to complete the project so proper bidding can be provided. Identify miscellaneous items such as drop structures, light standards, building foundations and property lines that may encroach into the geogrid zone. Engineer should determine if as-built documents will be required at the end of the project. If so, provisions should be set in place to document changes during construction. 1.2 Determining when engineering is required. Local codes and municipalities will have minimum height requirements set for walls that require engineering. However, height is not the only factor that should be considered. Engineering should be required for walls of any height that have any of the special considerations within this manual such as but not limited to the following: poor soils, multiple terrace arrangements, steep slopes above or below, high seismic loading, roadway surcharges, etc. 1.3 Make sure the site plans call out locations of all existing and proposed utilities. Have a process in place to verify location of existing utilities. Avoid placing utilities, especially storm sewer, sanitary sewer, water, landscape irrigation, and gas lines within the reinforced zone of segmental retaining walls. If no other alternatives exist, provisions should be set in place for future maintenance. 1.4 Determine wall layout, wall heights, conditions above and below the wall, as well as live and dead loads (locations and levels). Wall layout should be approved by the owner. Utilize the Wall Design Checklist in the Allan Block Spec Book. 1.5 Obtain a thorough geotechnical report in the area where the wall will be located. The geotechnical investigation and report should be paid for by the owner. If no other guidance has been provided, a geotechnical investigation should include soil borings with sampling and logs at an interval of not more than 15 m along the centerline of the proposed retaining wall(s). 1.6 Understanding the site soils as well as the soils used in the infill zone is essential to understanding how the retaining wall will function. One of the economic advantages to an SRW system is that site soils can usually be used in the infill zone provided they are of a certain quality and surface and groundwater conditions at the site are controlled by recommendations given in Chapter 3, Chapter 4 and Chapter 5. Proper internal drainage is installed including wall rock in and behind the facing and blanket and chimney drains to keep the infill mass dry, see Chapter 3, Chapter 4 and Chapter 5. In areas where frost heaves are possible, only soils with low to moderate frost heave potential shall be utilized. Verify parameters with geotech. Expanding the depth of wall rock behind the facing can help reduce the effects of frost heaves. See Chapter 6, Section 6.4 for information on the wall rock column. The cohesive shear strength parameter (c), for the reinforced fill, is ignored for internal and external stability analysis. Cohesion values are allowed in the foundation and global stability analysis. However, it is recommended that no more than 10% of the tested/reported values should be used due to the unpredictability of cohesive soils. The final design is checked by a qualified geotechnical engineer to ensure that the use of cohesive soils does not result in unacceptable time-dependent movement of the SRW system. High plastic or organic soils including MH, CH, OH, OL and PT are not recommended for any segmental retaining wall construction as their use can cause excessive settling over time and or excessive internal stress to build up causing internal lateral forces to occur. See Chapter 8 for more information on tall walls. 1.7 Visit the site to ensure that the site plans adequately capture the important details of the site. Surface water – lakes, rivers, ponds or detention basins, etc. Make determination that site soils appear to be similar to what is indicated in the geotechnical report. Proposed locations of structures, roadways and other surcharges. 1.8 Consider temporary construction loads and future snow and/or storage loads. Will construction loading govern design over final loading conditions? Snow loads are not only vertical but snowplows can provide lateral loading. Consider reinforced barriers to prevent the lateral loads. Magnitude of load will range depending on condition. 1.9 Establish scope of responsibility and required design methodology of project with owner including seismic design requirements. Design of SRW for structural stability including external stability (sliding and overturning), internal stability, internal compound stability and facial stability. Determination of the maximum unreinforced height of SRW. Design of geogrid layout for taller walls requiring soil reinforcement. Determination of minimum embedment of wall (except in the case of scour depth or erosion control issues, which should be determined by site civil engineer). Specification and/or approval of wall unit, geogrid reinforcement, drainage material within wall structure, and reinforced soil properties. Determination of what structures can or cannot be placed within reinforced soil zone and wall face, and detailing for SRWs to accommodate acceptable structures. Under the direction of geotechnical engineer, assist in the coordination of slope stability evaluation around and through the SRW and the design of the geogrid in reinforced SRWs to address slope stability in vicinity of SRW, as needed. If contracted to and notified, construction observation of the overall wall structure installation and review of SRW material submittals (generally on a time and materials basis, separate from the wall design contract). Unless other arrangements have been made between the owner and the wall design engineer, the wall design engineer is responsible for the area in and around the wall known as the Design Envelope – Figure 1-1. This Design Envelope is defined as follows: The horizontal distance, measured from the toe of the wall, is the greater of twice the height of the wall (2H) or, the height of the projection from the tail of the reinforcement layers to the surface (He) plus a distance equal to the length of the reinforcement (L). The vertical height is the height of the wall facing, measured from the top of the base to the top of the top facing unit (H). Agree upon the design method to be used, Allan Block, NCMA, AASHTO or FHWA. For information about the Coulomb Design Methodology see the Allan Block Spec Book. A complete step by step description can be found in the AB Engineering Manual. 1.10 Retaining wall design calculations should follow good engineering judgment and or standard design methodologies such as Allan Block, NCMA, AASHTO or FHWA. All methodologies should follow standard minimum design safety factors. For a thorough discussion and design methodology of each, see the Allan Block Engineering Manual. 1.11 All standard design methodologies listed in Section 1.9c use a coherent gravity mass design theory for stability calculations. A coherent gravity mass is made up of the wall facing and layers of geogrid reinforcement placed horizontally through properly compacted soils. The geogrid length, strength and horizontal spacing between layers are key to calculating the internal stability of the mass. Much independent testing has been performed on the mass as a whole and on the individual parts of the system. None more so than the connection between the geogrid and the wall facing. More information on the actual connection test method can be found in ASTM D 6638. It has been determined that walls constructed using 60% minimum lengths of grid and a two course (40 cm) maximum vertical spacing builds a high quality reinforced mass that easily distribute the calculated internal pressures. Testing has also proven that actual internal forces within a properly constructed reinforced mass are much less than the theoretical design loads based on active earth pressure calculations. Internal Compound Stability (ICS) calculations provide an analysis from a global stability perspective within the design envelope defined in Section 1.9b. 1.12 Require that Contractors must be trained and certified by local manufacturer or equivalent accredited organization. Allan Block and NCMA have certification programs that are accredited. Identify when advanced certification levels are appropriate based on complexity and criticality of project application. Require contractors to provide a list of projects they have completed. 1.13 Manufactured product specifications and associated test results. Specify allowable height deviations between adjacent units. To provide best quality units for construction reasons, a height tolerance between adjacent units should not exceed 3mm for walls over 3.0 m in height. Identify when freeze thaw resistance requirements are appropriate per ASTM C 1262. Geogrids should have “Mill Reports” or other proper documentation, See Chapter 7 for more information. 1.14 Freeze Thaw Durability: Like all concrete products, dry-cast concrete SRW units are susceptible to freeze-thaw degradation with exposure to de-icing salts and cold temperature. This is a concern in northern tier states or countries that use deicing salts. Based on good performance experience by several agencies, ASTM C1372, or equivalent governing standard or public authority, Standard Specification for Segmental Retaining Wall Units should be used as a model, except that, to increase durability, the compressive strength for the units should be increased to a minimum of 28 MPa unless local requirements dictate higher levels. Also, maximum water absorption should be reduced and requirements for freeze-thaw testing increased. Require a current passing ASTM C 1262 or equivalent governing standard or public authority, test report from material supplier in northern or cold weather climates. 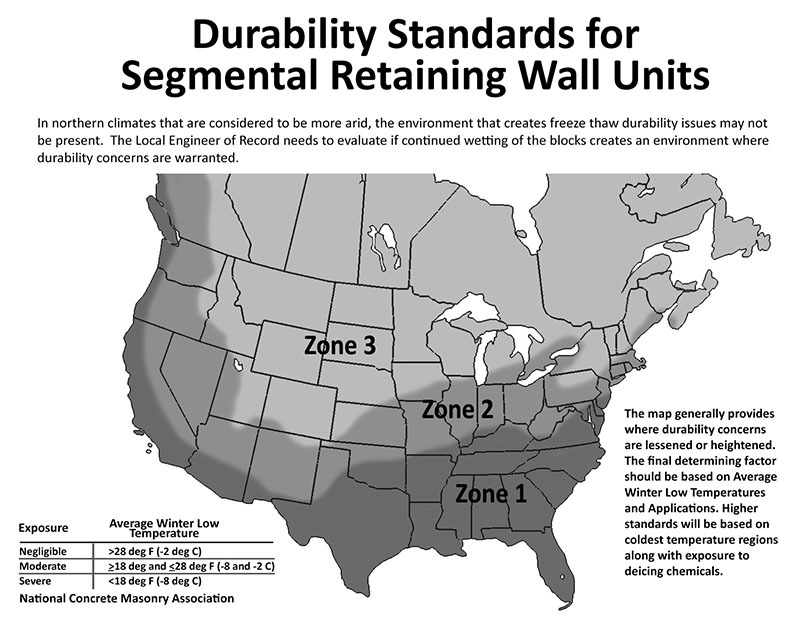 See Figure 1-2 for Freeze Thaw Durability Criteria and Regional Map to define the appropriate zone and requirements for the project. Avoid using SRW products for steps or walkways where de-icing salts will be used. Use SRW as the base material with a concrete or stone slab step cover. Where runoff may flow over or on to the wall, provide a collection basin and either pipe the water around the wall or provide an extended shoot where the saline water does not flow down the wall. Where de-icing chemicals land on a SRW retaining wall, consider a more durable capping unit. Durability concerns occur where there are saturated conditions in repeated freezing and thawing conditions. In areas where SRW’s are exposed to repeated exposure from snow removal equipment, consider sealants or water repelling chemicals periodically applied to the walls (silane, siloxane compounds). Compliance verification of durability requirements, as listed, may be confirmed without running the full test per ASTM C 1262 by testing the compressive strength and the absorption for product to be used to the standards set in ASTM C1372 following the test procedures outlined in ASTM C 140. Product shall have compressive strengths equal to or greater than those noted, and absorption values equal to our less than those note, during the most recent passing durability testing. 1 Exposure to de-icing salts is unlikely or unplanned, but may include occasional exposure. Average de-icing salt contact would be one or less exposure per year during the design life of the SRW. 2 Exposure to de-icing salts is likely or expected. 3 Compressive strength is a historical minimum guide to what has been found to provide units that pass weight loss requirements when tested to ASTM C1262. Actual Minimum Compressive Strength should be established based on results when testing to ASTM C 1262 and found to be in compliance with minimum requirements of ASTM C 1372, from the plant supplying the product. 1.15 Requirement for a pre-construction meeting with all parties associated with the project to approve design and best practice requirements. A pre-construction meeting should be held with all parties attending so the entire construction plan can be discussed from start to finish and any issues can be worked out with a plan in place to move forward successfully. All parties are all of those that will be working on or around the wall site including but not limited to the owner, architect, site civil, geotech, wall designer, general contractor, excavation contractor, wall builder, Allan Block supplier representative, railing or fence installer, local utility representative, inspectors (private and government as appropriate) etc. Language can be placed in the project specifications requiring a pre-construction meeting. Reference the AB Construction and Inspection Checklist in the AB Spec Book as a good agenda for the meeting. Meeting topics shall include, but not be limited to: contractor qualifications, schedule and phasing of wall construction and inspection, coordination with other on-site construction activities, responsibilities of parties, and source, quality, and acceptance of materials. 1.16 Include in the scope of the project three additional site visits. The first at the beginning of the project to reinforce the need for the contractor to comply with the specifications in the approved design and to answer any questions. The second visit would be a random site inspection to ensure that the work methods are in agreement with the approved plans and to answer any questions. The third visit to be at the conclusion of the project to verify that the details above and below the wall structure have been completed as required. Additional inspections are available at the request of the owner based on a preset rate schedule. A written summary will be provided to the owner at the conclusion of the project for each visit made to the site. Front wall profile view which depicts the location of geogrid reinforcement, elevation of top and bottom of wall and finished grade at bottom and top of wall. Wall station data with corresponding elevation for exposed grade at top and bottom of wall (i.e. profile data). Panel section markers depicting locations of design sections. Wall plan view depicting proper wall orientation should be provided. However, layout of walls should be done using the site plans provided by the owner based on survey information. Any required specialized or standard details that will provide guidance to the contractor, such as design specifications. 1.18 For the bidding process, the owner is recommended to provide the following to ensure accurate and comparable bids between contractors. The owner should provide a complete design for all walls, unless the project is a negotiated design/build contract on the front end. If design/build is used, the owner should ensure that a complete design is submitted and construction verification is validated by an engineering firm working directly for the owner. A complete bid package including items listed in Section 1.16, a complete geotechnical report including items listed in Section 1.5. Any other information or details about the site and final requirements that are pertinent to the completion of the project. Confirmation that the foundation soils are suitable for support of the structure. Confirmation that the retained soils are as defined in the wall design. Verify the reinforced soils comply with the material specified in the wall design. Confirm reinforcement material is that specified in the wall design. Verify the wall unit is that specified in the wall design. Document the construction process, verifying the wall is constructed in general accordance to the plans and specification. Perform the required soil testing in order to evaluate/validate that the soil placed meets the specified gradation, shear strengths, weight, Atterberg limits and compaction requirements. A detailed construction log should be used with sign offs at incremental levels by the responsible parties.